This Chicken Alfredo Pasta Bake is so cheesy, so creamy, and so full of flavor! I love this Chicken Alfredo Casserole for easy weeknight dinners. It’s filled with chicken, cheese, tomatoes, pasta, and vegetables, and cooked in a creamy Alfredo sauce. 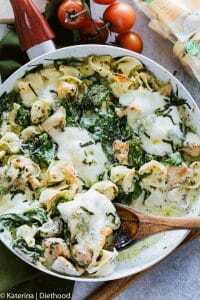 I can’t get enough of this Chicken Alfredo Bake! 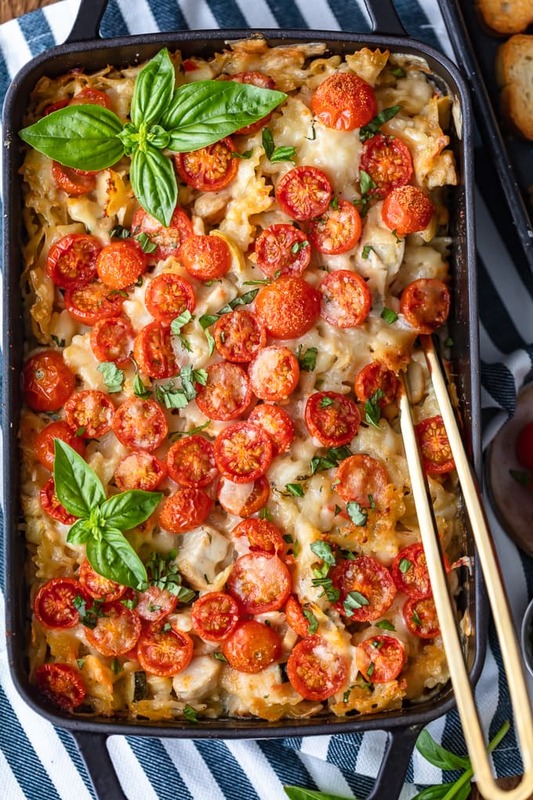 This Chicken Alfredo Pasta Bake is a delicious and cheesy dinner idea. Make this amazing chicken alfredo casserole for your next weeknight meal! Tomatoes, basil, and cheese is a classic combination. Mix that with chicken, Alfredo sauce, and a few other tasty ingredients, and you’ve got this delicious Chicken Alfredo Pasta Bake! This easy Chicken Alfredo Casserole makes a delicious weeknight dinner, but it’s just as good for a special occasion. The creamy Alfredo sauce is so rich and flavorful, and it blends perfectly with the pasta, chicken, and cheese as it bakes in the oven. SO yummy! 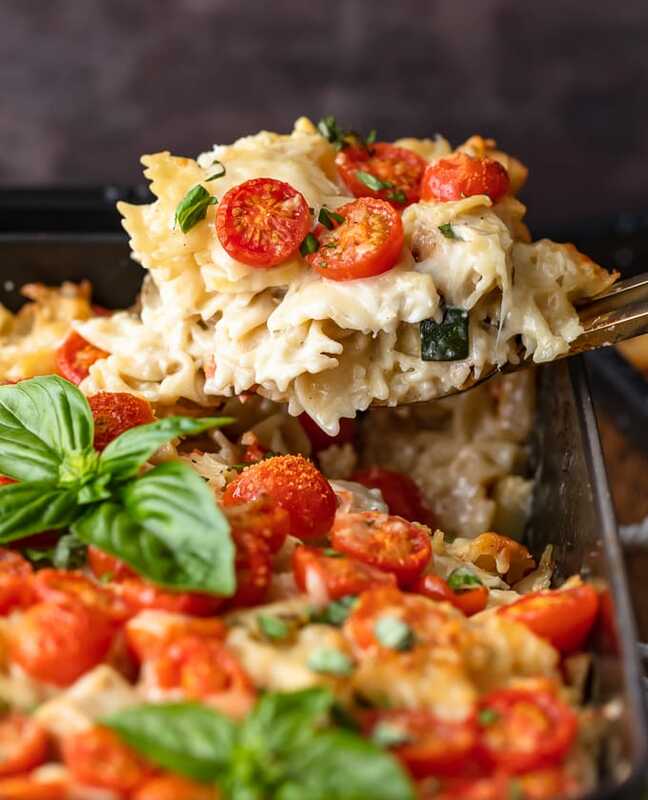 You’re going to love this flavorful Chicken Alfredo Bake, I just know it! How can you NOT love something this cheesy and creamy?! This Chicken Alfredo Pasta Bake is the perfect dinner idea for any night of the week. 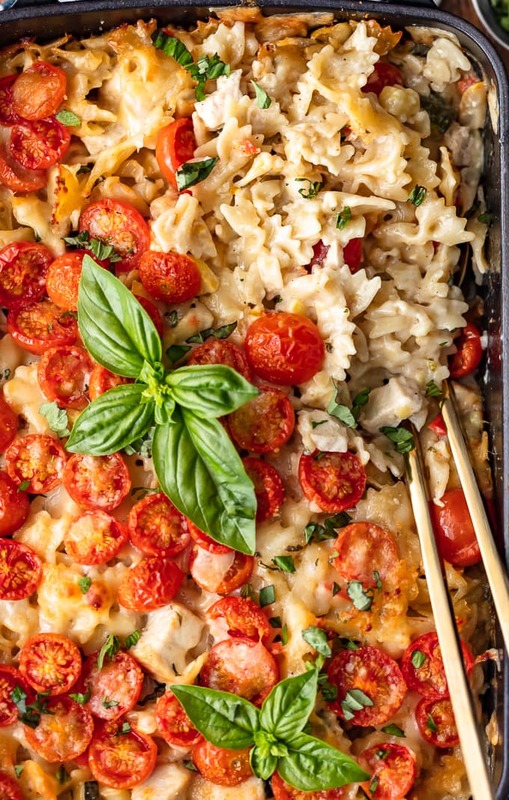 Chicken, cheese, tomatoes, pasta, and more, baked in a creamy Alfredo sauce. Yum! There’s no such thing as too many pasta recipes, or too many casserole recipes for that matter. Italian dishes are such a classic, no matter how you mix the ingredients. 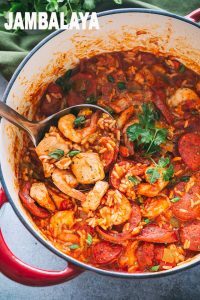 And casseroles are always a welcome stress-free dinner to make during the week. This Chicken Alfredo Casserole is the perfect combination of the two, which is why I love it so much for simple weeknight dinners. This cheesy, creamy Chicken Alfredo Bake is just too good! This tasty chicken alfredo pasta bake recipe is so simple! Most of the prep will be done on the stove top, then everything can be transferred to the oven to bake together. Start by cooking and draining the pasta, then set aside. Cook the vegetables on the stove top in a dutch oven, slowly adding in the rest of the ingredients. Add in the heavy cream for the alfredo sauce and let it thicken. Mix in the pasta, chicken, and cheese, and combine. Sprinkle the tomatoes and cheese over top. You can bake the chicken alfredo pasta in the dutch oven, or you can transfer it into a casserole dish. Bake pasta in the oven at 350°F for 20-30 minutes. In less than an hour, you can have this delicious Chicken Alfredo Pasta Bake ready to eat! See the recipe card below for detailed instructions! 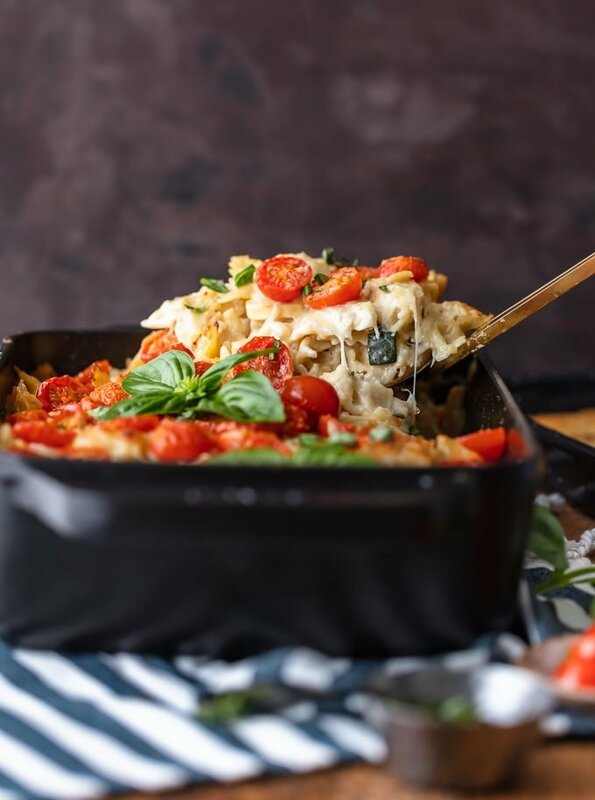 Chicken, cheese, vegetables, fresh tomatoes, Alfredo sauce, and more all baked together into one delicious dish. What’s not to love about this Chicken Alfredo Pasta Bake?! 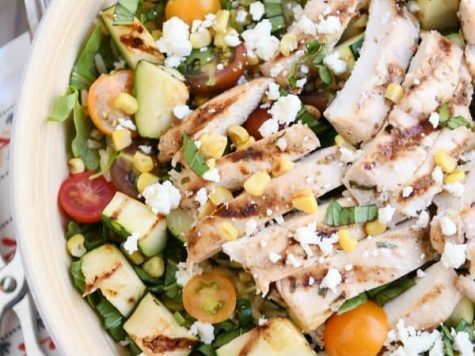 I really love dinner recipes like this. 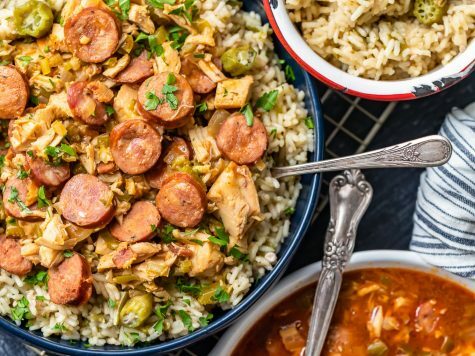 You can just throw everything together into one dish, bake it, and serve it up hot for an amazing dinner! 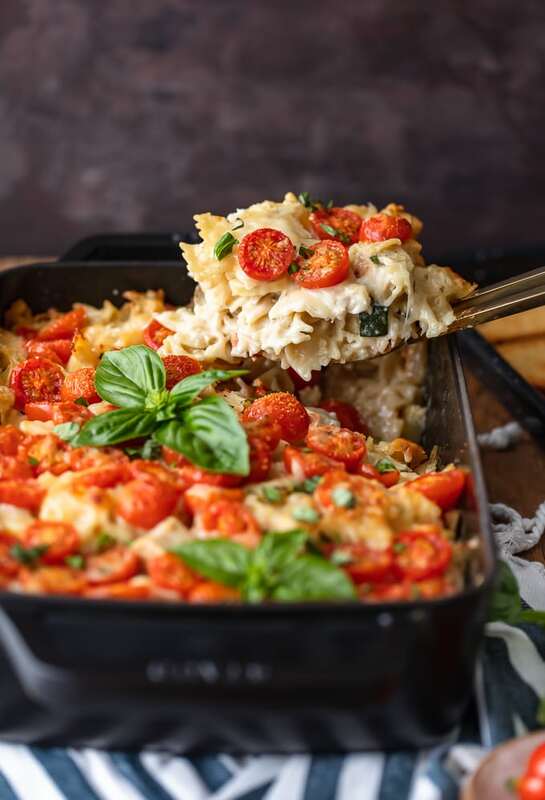 This Chicken Alfredo Bake recipe reminds me of a lot of my favorite Caprese recipes with the tomatoes, cheese, and fresh basil on top (you can mix Mozzarella into this dish or just use Parmesan…or any cheese you like, for that matter). It’s so good and I can’t wait for you to try it! Cheesy, creamy, and easy. 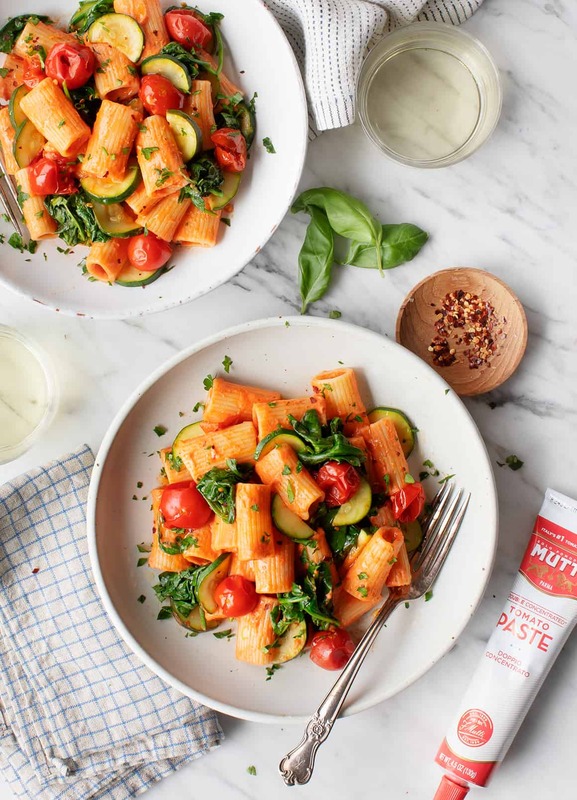 What more can you ask for from a pasta recipe? 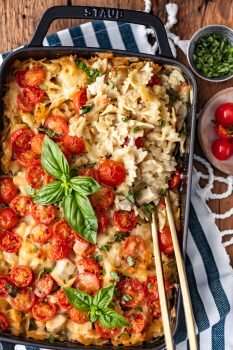 I love this Chicken Alfredo Pasta Bake and I know you will to! See the recipe card below for details on how to make Chicken Alfredo Pasta Bake. Enjoy! Unsalted chicken broth as needed for thinning. 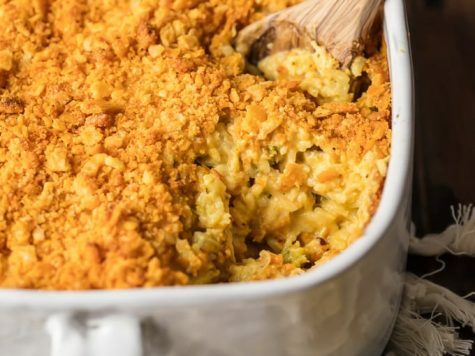 Heat the oven to 350°F and spray a 9×13-inch casserole dish with nonstick cooking spray. Heat a Dutch oven over medium heat and add the butter and oil. When the butter has stopped bubbling, add the diced onion and red pepper, and sauté the mixture for 2 minutes. Add the chopped squash and zucchini. 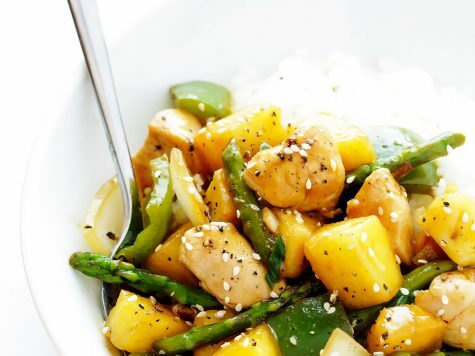 Sprinkle the vegetables with salt and pepper, to taste. Cook, stirring often, for 5 minutes (the vegetables should be almost fork-tender). Add the minced garlic, stir and cook 1 minute. Add the wine, while scraping the bottom of the pan, to deglaze the pan. Cook for 2 minutes. Add the heavy cream, whisking constantly, and season with salt and pepper, if needed. Cook the mixture for 2 minutes to thicken. Add the drained pasta, chicken and ½ cup grated Parmesan cheese. Stir until well combined. If the pasta/chicken mixture seems too thick, add additional chicken broth to thin a little. Pour the pasta mixture into the prepared casserole dish (*see note) and sprinkle the shredded or shaved Parmesan over the top. Spread the halved tomatoes on top and sprinkle with the other ½ cup of grated Parmesan. 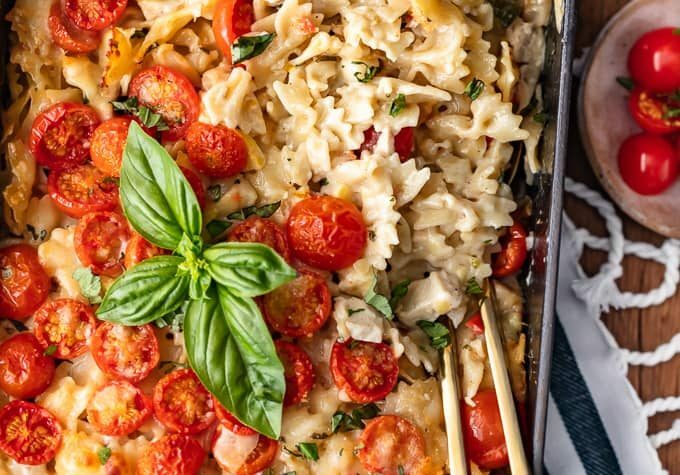 Remove the Pasta Bake from the oven and sprinkle with fresh, chopped basil. *Note: The Pasta Bake can be baked right in the Dutch oven instead of transferring it to a casserole dish.